Thomas noticed this pizza eyeing us from the freezer section the last time we were at Whole Foods, so I grabbed two boxes to try. I must say, after a lot of searching, I have finally found my favorite vegan frozen pizza! I’m not sure how long they’ve been making the vegan harvest, because it’s made with delicious Daiya goodness, but I hope they always continue to do so! The name is a litle deceiving, because the “harvest” part makes me think it should have a bunch of veggies on top. However, the “flatbread” part translates to a thin, wood fired earthen oven baked, perfect crust, that actually has a crust all the way around! Big points for that too, as I hate frozen pizzas without a border (I’m looking at you Tofurky!) . Not only that, but it doesn’t taste like a plain ole cheese frozen pizza. It’s got a lovely garlic thing going on too. Right now you can get a $1 off coupon from their website too that’s valid through 2012, so print away! I would love to see an additional vegan option with some of the gourmet toppings they have on their cheese pizzas like caramelized onions and sun dried tomatoes. For now I’m thrilled about this new find. Have you tried it? What did you think? What’s your favorite frozen vegan pizza? My wife doesn’t like it, but that is *ONLY* because it cannot replace real cheese. The texture, for her, is a bit too creamy. FOR ME, however, IT IS the BEST pizza I’ve EVER had, including those with actual cheese. This is an AMAZING product. This and Boca Spicy Chik’n patties are what I am existing on currently. I’m usually happy with no cheese and nutritional yeast, but for those times when I’m feeling it, Daiya does the job. I do know what she means about the creamy, but my qualm is that it leans on the sweet side vs. salty. Regardless, for fake cheese pizza, this one is the best I’ve found frozen! I just had this last night and it was delicious!!! I will definitely be buying it again. I thought it tasted a lot like Fettuccine Alfredo. I actually burnt my finger really bad taking it out of the oven, but it was well worth it. yah, i think it does have a FA quality! i think it’s the garlic! 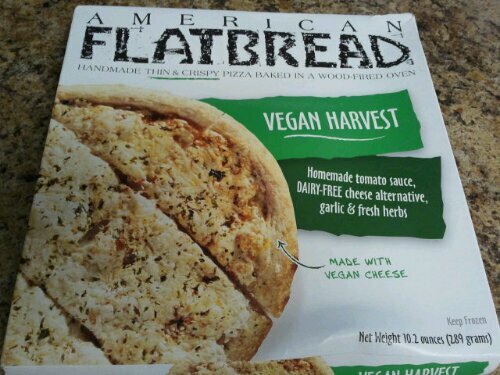 American Flatbread is one of the best frozen pizzas I’ve ever had in my life. I’ve never been let down by their quality or their unique tast. You gotta love it.